Join the County of Orange and OC Parks at the OC Zoo in observance of Bear Awareness Day on Saturday, May 7 from 10 a.m. to 3 p.m.
Visit OC Zoo on Bear Awareness Day and learn more about California black bears. 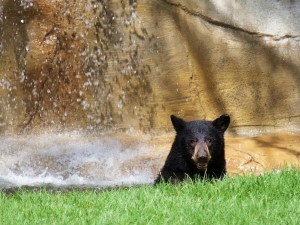 In addition to visiting all of the animals at the OC Zoo, guests will enjoy activities including bear crafts for kids, special zookeeper talks about bears, and a learning station where you can find out more about bear conservation and research, how to “bear proof” camping sites, and what to do if you see a bear. “Supporting the conservation of California Black Bears is an important service that the OC Zoo provides. The Bear Awareness Celebration is a fun experience for people to visit and learn more about bears,” said Supervisor Todd Spitzer, Third District. Reservations for Bear Awareness Day at OC Zoo are not needed. All of the activities offered at the event are free with paid OC Zoo admission. Zoo admission is $2 per person with ages 2 and under free and parking is $5. Come experience the animals of the OC Zoo and celebrate the Bear Awareness Day with the County of Orange and OC Parks.